CROATIA, a small country in the European family. Although small Croatia has a rich culture history. The most significant cultural influences come from the Central European and Mediterranean culture. Thankfully geographical position of Croatia provides plenty of potential in tourism. Indented coast with over 1200 islands with many things to see, of untouched nature to urban villas and apartments for vacation that can be rented and spend your vacation just the way you wanted to. Diving, sailing, paragliding, rafting are all additional offerings in the adventure you desire. For those a little more peaceful spirit Croatia offers several national parks and nature parks and the mountain atmosphere, because the unique offer of this country is that only half an hour away from Kvarner you can breathe fresh mountain air. One of the biggest advantages of Croatian tourist offer is rural tourism and the revival of an eco-villages where you can see an old preserved heritage and taste various local products and autochthonous flora and fauna that is very diverse from north to south. Such a small country but actually many traditions and diversity, in fact every area has its own cultural traditions and gastronomic specialties and is interesting is how many dialects and traditions have in so few kilometers but still cute how many people still to this day enjoy it and not let that their traditional customs shut down. Although Croatia has small surface area is actually a small country for a great holiday! If Baska is choice for your vacations, you have chosen the best known tourist resort on the island. 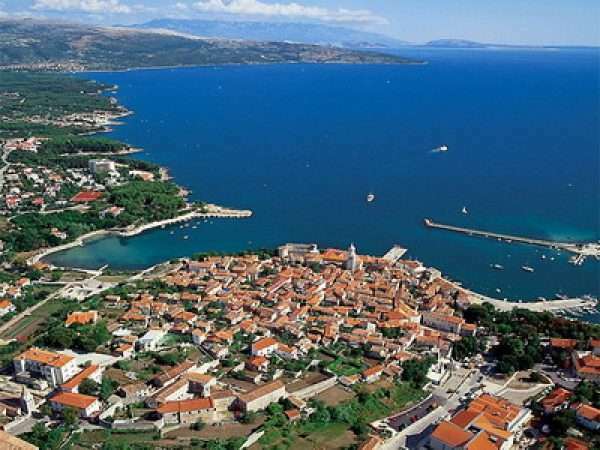 Connected to the mainland by bridge, and with the airport to Europe, Krk and Baska are the destinations that can be reached easily and quickly! Baska is one of the most desirable tourist destinations in the Croatian Adriatic.It is the position of Baška allow uninterrupted growth and prosperity, as well as a distinctive tourism in the environment. Situated in a quiet valley in the bay surrounded by vineyards, olive groves and flowering broom, with a picturesque background of the rocky mountains of Velebit and the islet, Baska as that is protected from all sides. Her unique beach of white pebbles, 1800 m long, crowned with a Blue Flag for environmental preservation.For this beach, justly said that one of the most beautiful in the Adriatic. To stay in Baška recognized tradition of tourism, which will be developed here over 100 years and also enjoy the amenities that make Baška modern tourist destination. All of you who have an adventurous spirit will find some privacy and solitude in one of thirty small sandy beaches which can be reached on foot or by boat.One of them can become your own little paradise in the beautiful and preserved nature. Baska is still intact and preserved gem of natural beauty. Lovers of beautiful landscapes, flora and fauna will be able to enjoy the beautiful animal species either on land or at sea. The specificity of the Krk landscape consists of and stone, huge area for collecting sheep, bordered by stone walls in the shape of a flower.These types of stone, preserved especially in the plateau area above the Baška valley, a real ornament Baška hilly landscape. It is widely known for its bora which the landscapes full of herbs offers a healthy life to all its residents and visitors. Baska is a rich historical and cultural heritage. Among these, the early Christians of the 5th century, the famous Baška Tablet, the most famous and oldest written Croatian National Monument to the abbey of St.Lucy and other valuable building of churches and chapels and valuable ethnographic collection of Native muzeja.Akvarij Baska offers you the unique experience of sea life and underwater world of the Croatian Adriatic. The aquarium is one of the largest collections of Adriatic mussels and snails in. Baska ... it is impossible to reach, and not come back again. City of Krk, the legendary blind Greek Homer in his famous poem mentioned Koureto, which the researchers associated just with the inhabitants of the island. The city is dominated by the cathedral complex, although not at a greater position. Krk's cathedral, with the famous castle town Frankopanski motive. Early Christian basilica built in the 5th century on the site of Roman baths. During the following years, the cathedral experienced a variety of styles, Romanesque, Gothic, Renaissance, Baroque through to today. It was first mentioned in written documents in 1186, and dedicated to the Assumption of Mary. The castle was built gradually from a number of elements. Today he is a square building, 27 m long and a 17 m wide, while its height perimeter walls of 9 m. In the north, the Kamplin the round tower. On the western corner is the square Frankopan courtroom, on the east towards the sea square tower, and on the western side is the observatory. In fact, Christianity came into the city early, which speak Illyrian epitaphs. The old town is entered through four doors and Krk intensively developed outside the walls only in the last few decades. The city walls with their doors had already been erected in the pre-Roman times and retained the same place today, albeit with many rearrangements, were determined by the internal layout of the city. Since the early Middle Ages in the city of Krk traces of catering, and its first guests were Czechs. Since then Krk with a series of new hotels and camp sites, a very strong center even at wider European levels. The city of Krk is today the administrative, political, economic and religious center of the island. The wealth that Dobrinj District boasts, their advantage over other destinations is the abundance and diversity of settlements, untouched nature of the belt through the dense pine forests of deciduous vegetation, typical Mediterranean landscapes with picturesque rocks and low vegetation, clear water with sandy and rocky beaches , tame and naturally protected coves ideal for water sports and underwater, natural healing mud, various cultural and historical sights, originality, peace, hospitality, domestic culinary specialties, and cultural climate. The municipality Dobrinj make settlements Cizici, Dobrinj Gabonjin, Gostinjac, Upper and Lower Hlapa, Klanice, Klimno, Kras, Meline, Field, Rasopasno, Rudine, salt works, Suzan, Saint John, Saint Vitus, Silo, Tribulje, Žestilac and Županje , which occupy the northeastern part of the island, one of his najuščuvanijih oasis. Dobrinj is always cultural, historical center of the homonymous municipality which belongs to the twenty one picturesque village. Malinska is situated in a wooded bay on the west side of the island, with another twenty surrounding villages Malinska belongs called Dubašnica. Dubašljanska Bay is full of coves and bays and due to this geographical position, this is the end is protected from cold winds, with low rainfall and over 260 sunny days a year. The climate is mild, Mediterranean. The clear blue sea and many beautiful beaches to enjoy the sea and sun. Small town Njivice is the largest Croatian island of Krk, which is located 40 kilometers from the city of Rijeka. His association with the bridge osatlim cities and towns it aside from other islands are connected by ferry. Njivice used to be a small fishing village and now is the right destination for odmor.Prekrasne beaches, bays, forests and various promenade are only part of the bid. Omisalj is located on the northwestern part of the island and is the first island town that found when crossing the Krk bridge. The historic town center is situated on a cliff 85 meters high and dominates this part of Kvarner. With the city of Krk, Omisalj is the oldest living town on the tourist island tradition for more than 100 years. About a thousand years before Christ lived in alj are Illyrians, then the Romans, and in the seventh century it came Croatians. In the 11thOmisalj century was an important center of Glagolitic literacy and, in the 12th century is referred to as Castri musculi (from the Latin Ad musculi - the place of shells), and in the 15th century, the dukes of Krk Frankopani it built one of its four castles. Because of this Omišalj now rightly bears the title of the city - the monument. Cultural and architectural heritage Omisalj extremely rich. Confirm that the remains of a Roman city Fulfinum the first century Christian basilica from the 5th Mirinecentury, and many other historical monuments. Part monumental 'offer' Omišalj exceeds chichi island neighbors, and in some categories even unique in Kvarner. Omisalj particularly abundant in more than a thousand years old which early medieval reliefs and elsewhere in coastal regions have a lot in a small alj saved them more than in some European countries. The town of Punat is situated in the southwest part of the Island of Krk, in one of the most protected bays on the Adriatic. Here, amidst the mild Mediterranean and the contrasts between the blue and the green, is the home of hospitable people to whom the climate has given the mildness and the rock and the sea have given them care and diligence. All the charm of the simple seaside ambience in the town of Punat comes from the narrow little streets, the passages, the terraces and the taverns keeping good wines, the primal whiteness of the nearby gravely beaches, and the vineyards and olive groves surrounded by rock. Punat also has a true gem in the middle of the bay – the islet of Košljun. These treasures encouraged the local people to invite guests to their town and enjoy Punat and its beauties together with them. This is why numerous tourist facilities have sprung here in Punat – we enrich them day by day because more and more people fall in love with Punat. Silo City is a tourist center Dobrinj municipality, typically is a small picturesque town for those seeking a holiday away from the real summer rush. Although the origin of one of the youngest municipalities Dobrinj, meaning it spreads beyond the tourist domain, just the 19th at Shiloh veljače 1905th was established, 'Krk Steamship Company,' who has purchased the steamer 'Dinko Vitezić; first June 1905. 'Dinko Vitezić' sailed to Crikvenica, which marked the beginning of the line Silo - Vrbnik - Crikvenica. According to data from the Maritime yearbooks 'for the 1937th year, Silo had 9 ships with 119 gross tons and 15 crew members. Although no hotel services, Silo has sufficient capacity in the private placement, while the indigenous, national and international food and drinks can be consumed in several restaurants. Silo is celebrating its 16th dayAugust, the Feast of St. Rocco, which has continued the tradition started in the mid 19th century, when plague our region. Silar I have, like many others, vowed to St. Roch to spare them the plague, hence rokovske votive procession from the fields to the church of St. Nicholas Church in Shiloh. Vrbnik simply must see! Vrbnik located on the east coast of the island. Located at about 49 m high cliff above the sea. The old town is really fascinating. Required pronađiete narrowest street in the world, Vitezić library, an interesting exhibition in the tower, a handful of Glagolitic inscriptions.Oldest Croatian Glagolitic is a letter from devtog century, and it Vrbnik is known worldwide for its Glagolitic cultural heritage but also for excellent dry white wine, authentic - Vrbnička zlahtina! In and around Vrbniku Vrbnik has very nice beaches. Vrbnik the right choice for connoisseurs who do not want mass tourism but are looking for the original Mediterranean charm.